Observing the quiet contemplative colors of Winter. Nuno Felting is achieved through the stacking & layering of merino wool fibers onto hand dyed silk, carefully varying their lengths & alignments in a fashion that allows for controlled shrinkage. The resulting felt maintains just the right amount of movement & drape for its function as good design & clothing. wall quilt 30" x 30"
In the summer of 2013 we charted a boat and went cruising in the San Juan and Canadian Gulf islands. One of our favorite ports was Cowichan, BC, where the harbor was dominated by the headquarters of the Cowichan Wooden Boat Society. The building had railings which cast dramatic shadows in the water beneath. In the late evening, everything was black and white. By zooming in on the reflections I found dramatic images that looked like abstract expressionist paintings. The design for this quilt was inspired by one of my photographs. Handwoven wool and rayon. Washed and fulled, so that the wool shrank and the rayon ruffled. 24" x 24" x 3.5"
The pages of these reconstructed books refer to a bit of scattered snow on a wintery beach. This is the same image as Reflections of Cowichan #1 with the lights and darks reversed. Wire Nest Sculpture covered in handmade paper and found natural objects. Book pages are in a clamshell. Handwoven wool and tencel. Washed and fulled, so that the wool shrank and the tencel ruffled. 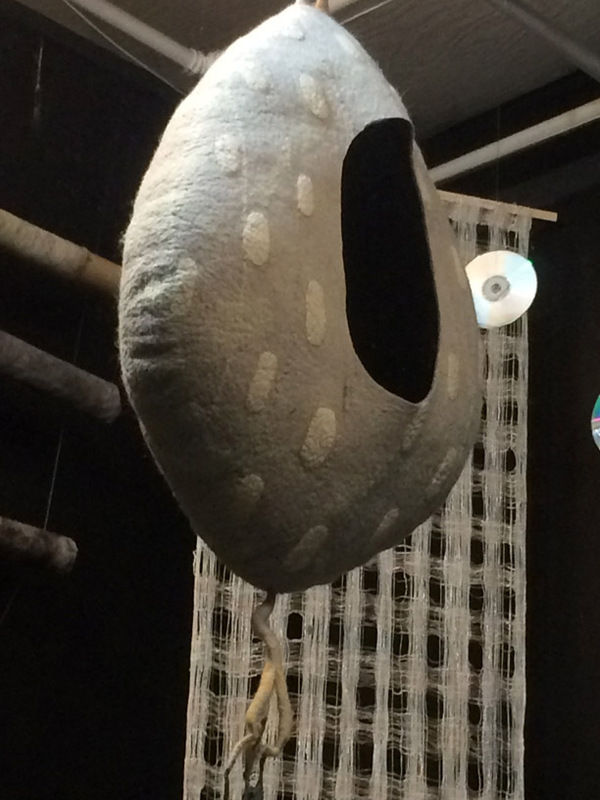 Small sculptural wet-felted pod, a variety of felted driftwood with various appendages.